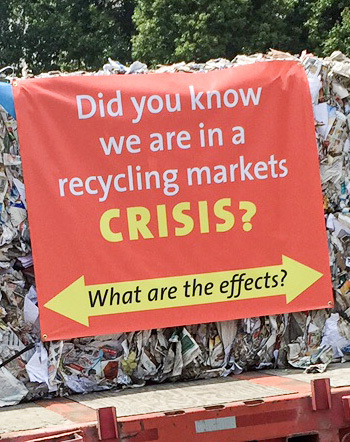 For a general overview, please read read this January 2019 insert to the Sacramento Bee– Recycling in California– THE CRISIS NO ONE IS TALKING ABOUT. Residential customers, please review the Spring 2018 edition of The Recycler. Multifamily and commercial account holders, please review our May 2018 edition of Waste Matters. Know Where It Goes. Sort Smart! Please brush-up your knowledge of proper sorting. Organics Recycling – Please contact us if you are not yet participating in this program. Note that in the absence of an Organics collection cart/bin, food scraps and food-soiled paper belong in the garbage. 1/30/19: Waste360.com – Paying for Material Recovery: What’s in Your Wallet? 1/28/19: Next City – Rethink, Retool, Then Recycle? 1/7/19: VICE on Facebook (video) – China’s Waste Ban is Causing a Trash Crisis in the U.S.
1/1/19: Waste Advantage Magazine – Could Opportunity Rise from the Chinese Recycling Crisis? 12/14/18: PRI – New Chinese policy is forcing people to think: Is there a better way to recycle? 5/24/18: Berg Mill Supply – Is Recycling’s Future Headed Toward the Trash?